When you finish configuring and testing Postman, you can start sending additional requests to the Amazon Pinpoint API. This section includes information that you need to know before you start sending requests. It also includes two sample requests that help you understand how to use the Amazon Pinpoint collection. When you complete the procedures in this section, you submit requests to the Amazon Pinpoint API. These requests are capable of creating new resources in your Amazon Pinpoint account, modifying existing resources, sending messages, changing the configuration of your Amazon Pinpoint projects, and using other Amazon Pinpoint features. Use caution when you execute these requests. You have to configure most of the operations in the Amazon Pinpoint Postman collection before you can use them. For GET and DELETE operations, you typically only need to modify the variables that are set on the Pre-request Script tab. When you use the IAM policy that's shown in Step 1.1, you can't execute any of the DELETE requests that are included in this collection. For example, the GetCampaign operation requires you to specify a projectId and a campaignId. On the Pre-request Script tab, both of these variables are present, and are populated with example values. These example values are highlighted in the following image. Delete the example values and replace them with the appropriate values for your Amazon Pinpoint project and campaign. For POST and PUT operations, you also need to modify the request body to include the values that you want to send to the API. 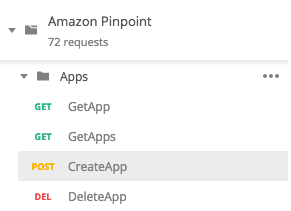 For example, when you submit a CreateApp request (which is a POST request), you have to specify a name for the project that you create (in Amazon Pinpoint, a "project" is the same thing as an "application"). You can modify the request on the Body tab. In this example, replace the value next to "Name" with the name of the project. If you want to add tags to the project, you can specify them in the tags object. Or, if you don't want to add tags, you can delete the entire tags object. The UntagResource operation also requires you to specify URL parameters. You can specify these parameters on the Params tab. Replace the values in the VALUE column with the tags that you want to delete for the specified resource. Before you create segments and campaigns in Amazon Pinpoint, you first have to create a project. In Amazon Pinpoint, a project consists of segments, campaigns, configurations, and data that are united by a common purpose. For example, you could use a project to contain all of the content that's related to a particular app, or to a specific brand or marketing initiative. When you add customer information to Amazon Pinpoint, that information is associated with a project. 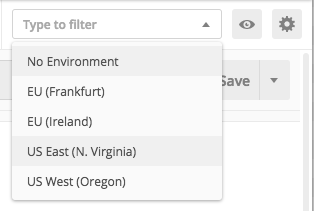 On the Environments menu, choose the AWS Region that you want to create the project in, as shown in the following image. In the Apps folder, choose the CreateApp operation, as shown in the following image. On the Body tab, next to "Name", replace the placeholder value ("string") with a name for the campaign, such as "MySampleProject". Delete the comma that after the campaign name, and then delete the entire tags object on lines 3 through 5. When you finish, your request should resemble the example that's shown in the following image. Choose Send. If the campaign is created successfully, the response pane shows a status of 201 Created. You see a response that resembles the example in the following image. It's very common to use the Amazon Pinpoint SendMessages API to send transactional messages. 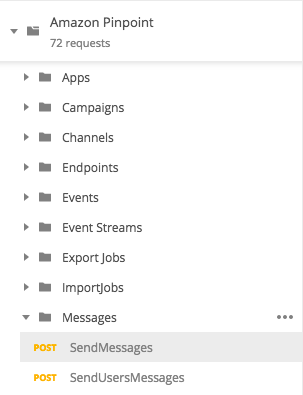 One advantage to sending messages by using the SendMessages API (as opposed to creating campaigns), is that you can use the SendMessages API to send messages to any address (such as an email address, phone number, or device token). The address that you send messages to doesn't have to exist in your Amazon Pinpoint account already. Compare this to sending messages by creating campaigns. Before you send a campaign in Amazon Pinpoint, you have to add endpoints to your Amazon Pinpoint account, create segments, create the campaign, and execute the campaign. The example in this section shows you how to send a transactional email message directly to a specific email address. You can modify this request to send messages through other channels, such as SMS, mobile push, or voice. Verify the email address or domain that you want to use to send the message. For more information, see Verifying Email Identities in the Amazon Pinpoint User Guide. In Amazon Pinpoint, you can only send email from addresses or domains that you've verified. You won't be able to complete the procedure in this section until you verify an email address. On the Environments menu, choose the AWS Region that you want to send the message from, as shown in the following image. In the Messages folder, choose the SendMessages operation. On the Pre-request Script tab, replace the value of the projectId variable with the ID of a project that already exists in the Region that you selected in step 2 of this section. "Data":"<h1>Test message</h1><p>This is a sample message sent from <a href=\"https://aws.amazon.com/pinpoint\">Amazon Pinpoint</a> using the SendMessages API.</p>"
"Data":"This is a sample message sent from Amazon Pinpoint using the SendMessages API." In the preceding code, replace sender@example.com with your verified email address. Replace recipient@example.com with the address that you want to send the message to. If your account is still in the Amazon Pinpoint email sandbox, you can only send email to addresses or domains that are verified in your Amazon Pinpoint account. For more information about having your account removed from the sandbox, see Requesting Production Access for Email in the Amazon Pinpoint User Guide. Choose Send. If the message is sent successfully, the response pane shows a status of 200 OK. You see a response that resembles the example in the following image.